Driving out to Broken Hill alone last year I just had to turn the music off. Outside Wilcannia, the country had turned into semi-desert and stretched to the horizon, ochre and awesome, in all directions. The music I was listening to seemed suddenly paltry and chattering, so I killed it, preferring to listen to the big hum of eternal silence that filled the world out here. The interior Australian landscape – of outback, desert and rainforest – is one that has shocked artists into creativity for years now. From Peter Sculthorpe’s ‘Sun Music’ to Icehouse’s ‘Great Southern Land’, musicians have tried to catch and express that feeling: the feeling I had on the road to Broken Hill. It is a truly spiritual thing and thus one that music, with it’s lack of hard literal references, is perfectly suited to express. Multi-instrumentalist Paul Cutlan has always had a spiritual halo around his music. Whether playing 17/8 Balkan skirls with MARA!, Dolphy bop with Ten Part Invention or in simpatico duet with fellow saxophonist Andrew Robson, Cutlan’s approach to playing has always surprised, elevated and talked in tongues. His new recording, Across the Top, with bassist Brett Hirst and improvising string ensemble The NOISE, does all of those things and more. 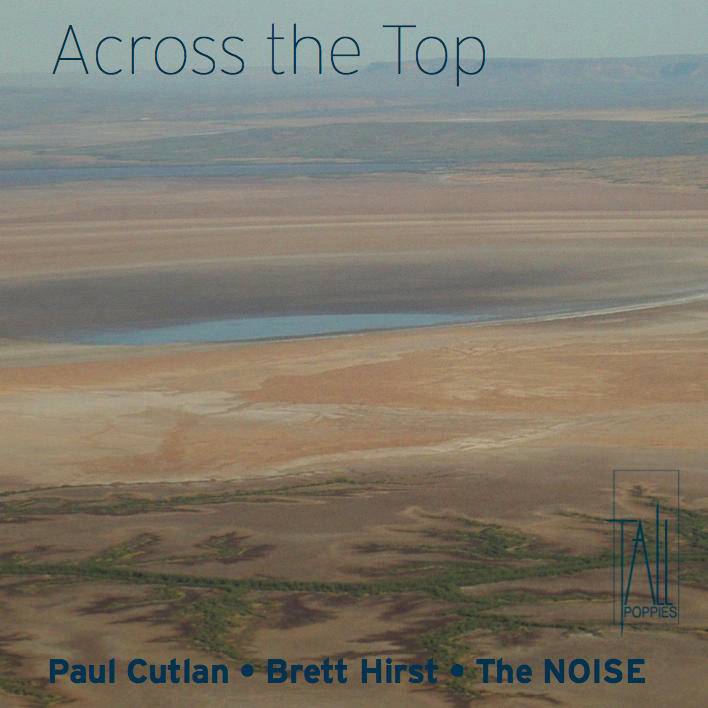 At the centre of the album is the ‘Across the Top Suite’ – a five-part work inspired by Cutlan’s experiences of The Pilbara and Kimberleys regions of north-west Western Australia while on tour with world music group MARA! Across the five movements Cutlan, Hirst and The NOISE’s Veronique Serret, Liisa Palandi, James Eccles and Oliver Miller invoke and evoke the space, the life, the wonder and a spiritual sense of place. The instrumental range and technical innovations they work through are breathtaking in themselves. Cutlan’s solo bass clarinet intro to ‘Gibb River Road’ suddenly startles with didgeridoo squawks and rasps, before Hirst brings a Latin groove to the tune proper. The high-harmonic strings intro to the ‘Lost Souls’ section has a flecked aridity to it, reminiscent of painter Fred Williams’ outback landscapes – large space with burned-out details. ‘Lost Souls’ sings with Bartok-like twining lines before lurching into a Bulgarian 5/8 Pajdushka rhythm driven by percussionist Mara Kiek’s tapan drum. The European influences abound – Stravinsky (the ‘Reconcile’ movement brings to mind ‘A Soldier’s Tale’), Russian orchestral music, as well as the Balkan folk flavours – yet never seem to jar against the ochre sound-pictures painted by Cutlan’s compositions. The ‘Across the Top Suite’ hangs together impeccably despite Cutlan’s cultural play. Wrapped around the central suite are three other pieces that show the uniqueness of composition and ensemble. Album opener ‘Times Past’ has bass clarinet and double bass improvising against fluidly meshed string textures. The entirely improvised piece ‘The Dawning Dark’ concludes with an almost electronic machine-howl and grind produced out of purely acoustic instruments. Closer ‘Perhaps Next Time’ finishes the album with a Latin groove that pulls apart and comes together organically and almost magically. There is much magic to Across the Top, and much depth. Paul Cutlan has produced a work that is entirely of its own world, taking much that is good from a range of genres and influences – and, like any worthwhile artwork, life itself – and filtering it through his own unique vision. Album available thru Paul’s website or Tall Poppies Records.